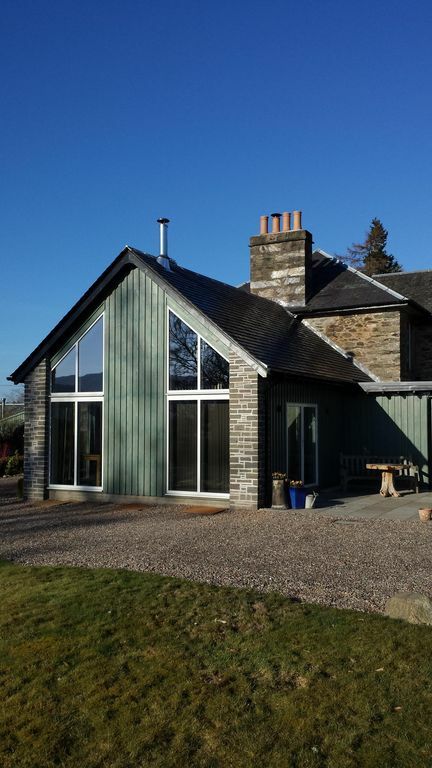 Open views to the surrounding countryside and an excellent base to explore Scotland. Modern, split-level, self contained apartment with underfloor heating and wood burning stove. Fully equipped kitchen area with dishwasher, microwave, oven, hob and fridge. Kingsize bed on mezzanine floor. Shower room with walk-in shower. TV and WiFi. Quiet patio area and parking beside the property. Kindling and wood are provided. Salt and pepper, sugar and olive oil are provided. Butter and milk are in the fridge for your arrival and tea and coffee are provided to get you started. It was perfect! Just as advertised but with little extras too. Great place to stay. Very comfortable with a well stocked kitchen having everything you need just like being at home. Perfect cottage to relax after a long day of sightseeing. The owners, Adeline and Jonathan,were very kind and helpful. We really enjoyed our stay. Nice modern interior with everything you need. The property was perfect with everything we wanted for a great stay. Owner has a great attention to detail some lovely touches by the owner. It has a great location allowing us to drive to some lovely areas. You can walk from the property into the local village which has a lovely pub with great food. It also has a local shop within walking distance which is also really useful. Would certainly recommend friends and family the property. Fresh, cosy and modern in beautiful surroundings. Just perfect. Everything in the beautifully appointed cottage was of a very high standard and we were made to feel very at home. Enjoyed a wonderful stay at this property while visiting Pitlochry to see the enchanted forest. The property itself is excellent with modern equipment and decor as well as offering great views in an amazing location. The small touches such as the bottle of prosecco just top off a wonderful stay. Will definitely be back.